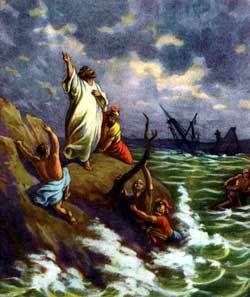 A SHIP WASleaving port of Caesarea, and among the passengers on board was Paul, the prisoner. As the shore faded away in the distance, Paul saw his last glimpse of the land that is dear to the heart of every Jew, for never again would he return to this country. Paul was not the only prisoner on board that vessel. Before leaving Caesarea he and several others had been given into the keeping of a Roman centurion whose name was Julius. Festus had commanded this centurion and his soldiers to bring the prisoners safely to Rome and deliver them to Caesar. After resting for some the captain of the vessel thought about putting out to sea once more. But Paul protested, saying, “This voyage will bring much trouble upon us, for sailing at this time of the year is very dangerous.” He urged them to remain in that port for the winter. But the centurion believed they could reach another port not far away. And because the port at the Fair Havens was not a desirable place, the captain and many of the passengers were eager to go farther before they should stop for the winter. On the first fair day the ship glided out of the harbor and entered the broad sea. Now the Roman officer believed Paul’s words, so he hastily cut the ropes that held the boat, allowing it to drift away into the darkness. When the daylight was coming on Paul urged those on board to take food. For many days they had not eaten a proper meal, being too worried to feel their hunger. Now they were weak, and Paul knew their bodies needed food to strengthen them. He reminded them of the angel’s words, that not one hair of their heads should perish; and when he had spoken thus he took bread and gave thanks to God before them all. This entry was posted in Discipleship and tagged theology. Bookmark the permalink.